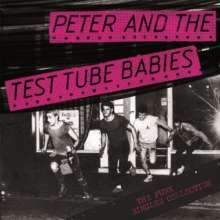 Der Artikel Peter And The Test Tube Babies: The Punk Singles Collection wurde in den Warenkorb gelegt. Formed in 1978 in the smalltown of Peacehaven by Del Strangefish and Pete Bywaters, Peter & The Test Tube Babies have been one of the most representative and longest running UK OI! bands ever. Unlike most bands of this ilk, their line-up remained pretty stable through the years, mostly thanks to Peter and Del never giving up the ghost. This unique collection gathers together the A and B sides from the Test Tubes early, most successful years starting with their 1982 debut single on the legendary No Future label, up to their later hits on Jungle and Trapper Records ending 1985. This essential collection provides a close look at the band's peak, and includes the UK Indie Chart hits »Banned From The Pubs« (#10), »Run Like Hell« (#2), »Zombie Creeping Flesh« (#2), »Blown Out Again« (#40), »Wimpeez« (#8) and »Keys Of The City« (#14).